Policies are central determinants of overall economic performance affecting progress towards agricultural, nutrition and food security goals. Policy decisions shape the incentives and actions of farmer, consumer and industry groups. The ability to have an impact on policy decisions requires a strong understanding of a given country’s underlying policy processes. Suresh Babu, Senior Research Fellow, Head of Capacity Strengthening at the International Food Policy Research Institute (IFPRI), underlines one of the challenges: “How are policies made? Sometimes it’s transparent, sometimes it’s based on evidence, but it’s not always clear. In order to understand the policy process, one has to come up with a model.” In response to this need, the Feed the Future Innovation Lab for Food Security Policy (FSP) developed the “Kaleidoscope Model” (KM). This model offers several practical tools for stakeholders interested in improving policy system performance or those aiming to intervene more effectively in a specific policy setting. The KM identifies a set of 16 variables that have proven consistently important in motivating policy reform and influencing policy design, implementation, evaluation and reform. It’s called the Kaleidoscope Model because, just as shifting a kaleidoscope refracts light in a new pattern, so does focusing on a particular element of the policy process reveal a different constellation of key variables. Like the pieces of colored glass inside a kaleidoscope, many of the underlying variables remain relevant as policy dynamics unfurl, yet some factors play a disproportionately larger role in driving policy change at a particular point in time. The structure and content of the KM originally were extracted from two bodies of knowledge. First, the model derives insights from international development policy experience through an extensive review of available evidence on episodes of policy change in developing countries, across a broad range of policy domains related to food security, and including agriculture, education, healthcare, nutrition, and social protection. Second, it draws on the large academic literature on policy systems, published primarily in public administration and political science. Subsequent primary field research on input subsidy policies and micronutrient interventions in Ghana, Malawi, South Africa, Tanzania and Zambia helped further refine the KM. “Policy processes are often considered too complex and country-specific to warrant being a separate area of inquiry. The contribution of the Kaleidoscope Model is to recognize this complexity but also to highlight some key factors that influence policy processes regardless of the country under investigation. This can hopefully begin to generate cumulative knowledge about when and why policy reforms related to food security are more, or less, likely,” says Danielle Resnick, leader of the FSP team that developed the KM. The KM case studies suggest a series of criteria that governments and interested stakeholders can apply to identify fruitful arenas for engaging in policy reform processes. For example, technical problems with inexpensive solutions (such as salt iodization) prove easier to solve than complex, expensive policies (such as fertilizer subsidies). Policy arenas with limited opposition – typically those without major rents and hence few entrenched financial interests – offer the greatest prospects for successful policy reform as do those, such as micronutrient supplementation, that piggy-back on existing heath system infrastructure. Credible evidence helps to advance policy reform, but it proves most effective in policy arenas with well-accepted technical solutions and without large rents and highly motivated opposition. Across all policy domains, shifting administrations, the arrival of new decision-makers and institutional restructurings offer clear opportunities for policy reform. By providing a simple, applied framework for analyzing key drivers of policy change in food security, agriculture and nutrition, the KM has effectively guided the ways the FSP team has been able to support and implement successful policy reforms. Figure 1. 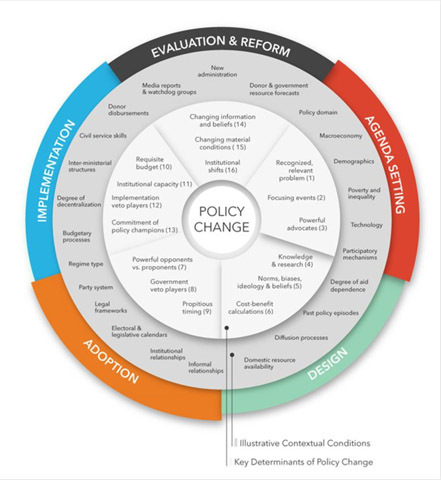 Kaleidoscope Model of Policy Change, Source: Resnick et al. (2018). Resnick, Danielle, Steven Haggblade, Suresh Babu, Sheryl L. Hendriks and David Mather. 2018. 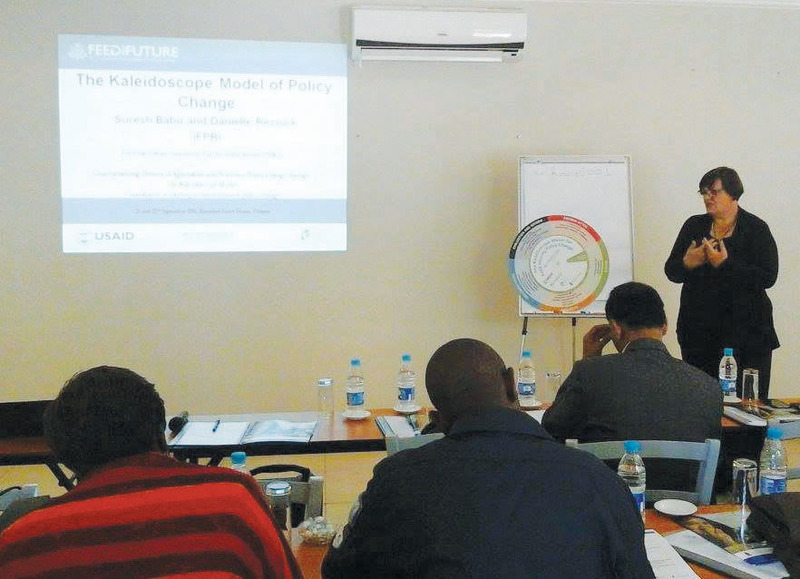 The Kaleidoscope Model of policy change: Applications to food security policy in Zambia. World Development, 109:101-120. Steven Haggblade, Suresh Babu, Sheryl Hendriks, David Mather, Danielle Resnick. 2017. What Drives Policy Change? Evidence from Six Empirical Applications of the Kaleidoscope Model. Feed the Future Innovation Lab for Food Security Policy Research Brief 31. East Lansing: Michigan State University.